The Rangers series of shooting glasses offers ophthalmic quality eyeglass frames with interchangeable lenses. Each pair of lenses can be specially formulated to enhance your target picture under almost any lighting conditions, bright sun to rain or fog. 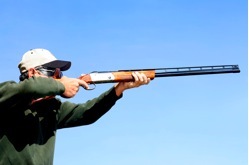 The Shooting Sports experts at Parrelli Optical in Beverly and North Andover can help you see what you want to hit. Randolph Engineering Shooting Glasses only at Parrelli Optical® in Beverly and North Andover.